But who wants to wait to be back in that magical world again?! If you can’t, Harry Potter and the Deathly Hallows Part 1 looks great on high-definition Blu-ray and sounds even better. 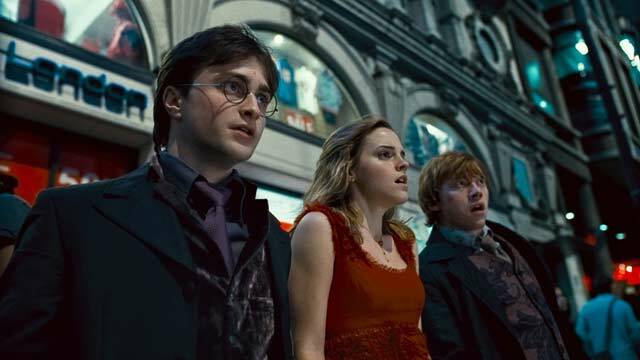 Nagini’s evil hissing, the pops and bangs and explosions, even the quiet moments when Hermione, Ron and Harry are weighing the enormity of what’s ahead of them surround us in the movie. One warning: Director David Yates’ film is dark — visually, as well as in the subject matter — and the Blu-ray’s black is so black, you’ll need good blackout curtains to see all the details during a daytime viewing. The special features package is plentiful, but Warner has strayed away from the game it included on the earlier movies. It’s as if the studio recognizes that the audience has grown up with the story and deserves only grown-up extras now (although, I’m a kid at heart; I like the games). Two Blu-ray discs come in the Blu-ray/DVD combo (as well as the movie on standard-definition DVD and a downloadable digital copy). One disc has the movie playable with or without Maximum Movie Mode and the other has more special features. The Maximum Movie Mode is the highlight of the set, and it is extensive. In Warner’s Maximum Movie Mode, which the studio also featured on Sherlock Holmes among others, the movie plays with interruptions for interviews, flashbacks, behind-the-scenes videos and more. It’s hosted by actor Jason Isaacs (Soldier), who plays Lucius Malfoy, but many others from in front of and behind the camera are featured, including Tom Felton (Draco Malfoy) reading passages from the book. Maximum Mode has lots of interesting tidbits, some of which overlap with the other special features on the discs, but it does make the movie experience long. On the second Blu-ray, there are some nice deleted scenes and a bunch of brief featurettes, the best of which is “The Seven Harrys.” In it, Daniel Radcliffe talks about how he prepared for the scene in which he plays Ron, Hermione, Fleur, Bill and others playing himself. It’s a fun behind-the-scenes look at a sequence that offers a nice moment in the film. In another featurette, Ron actor Rupert Grint plays golf with Felton, James Phelps (Fred Weasley) and Oliver Phelps (George Weasley), and they look back at their growing up while making the Harry Potter films. Check out the great car they built and drove for charity. There’s also a making-of featurette, a look at the music design and a piece on who can run the fastest: Harry’s Daniel, Ron’s Rupert or Hermione’s Emma Watson. All in all, it’s a good package, even if we do still have to wait for the movie to end. Oh, one quick note on the menu: The blue-colored option is the one you want to choose. You might think — like us — that it’s the one in white, because the white is brighter and draws your eye, but no. Don’t press the wrong thing. Click when the option you want is in blue, not white.